Very often expectant mothers prescribed the drug "Magnesia" (magnesium sulfate). The drug prevents the development of complications of pregnancy: relaxes blood vessels and smooth muscles with hypertonicity of the uterus and threatened miscarriage, removes fluid from the body in edema and leads to normal blood pressure. "Magnesia" (magnesium sulfate) can be administered during magnesium deficiency, hypertonicity of the uterus, threatened miscarriage or premature birth, high blood pressure, swelling, preeclampsia (a complication of a normal pregnancy, characterized by disorder of the functions of some internal organs), predisposition to thrombosis, eclampsia (severe toxemia of the second half of pregnancy). This medication should be prescribed by a gynecologist. Magnesium sulfate helps to eliminate fluid from the body. In the treatment of "Chalk" is used only intramuscularly or intravenously administered. The dose of the drug depends on the condition of the pregnant woman. Most often prescribe 25% solution of "milk of Magnesia" with a single dose of 20 milliliters. Intramuscular injections of magnesia is quite painful. When properly done injection location injection can become inflamed. Before the injection is required to warm the solution and be sure to use a long needle. The drug has to be administered very slowly and intramuscularly, and intravenously. Contraindicated to inject the drug low blood pressure. If after the administration of magnesium sulphate pressure plummeted, the drug should be lifted. "Magnesia" is not prescribed in the first trimester of pregnancy, and in subsequent periods it is used only under the supervision of a physician. It is believed that late-term short-term use of the drug is harmless to mother and child, however, in the prenatal condition (two hours before delivery) introduction magnesium is contraindicated. With the introduction of the drug need to be careful to the dosage. Overdose "Magnesia" can lead to violation of activity of a brain. Excess magnesium can cause fetal respiratory distress. You cannot apply the "Chalk" calcium supplements and biologically active supplements. The drug is contraindicated in chronic renal failure, severe, case of hypersensitivity to magnesium sulfate, with oppression of the respiratory center, severe bradycardia (decreasing heart rate), AV-blockade (partial or complete breach of conduct impulses from the Atria to the ventricles). "Magnesia" can cause the following negative effects: lowering blood pressure, slurring of speech, nausea, vomiting, drowsiness, weakness, anxiety, headaches, sweating, a rush of blood to the face. Dropper magnesia are one of the most safe and effective ways to address the various complications that often arise during pregnancy, and maintaining the overall health of the body of the expectant mother. Magnesia is a solution of magnesium sulfate, which via intravenous drip administered to a pregnant woman through an active therapy. Sensations arising in this procedure can not be called pleasant, but strong discomfort they cause. - General weakness and malaise, insomnia, irritability and poor health of the patient. Duration, during which pregnant women do a drip, and also the necessary intensity of therapy is determined strictly individually, depending on the initial state of the patient. One of the main positive effects, which has a dropper magnesia during pregnancy, is the rapid reduction of high blood pressure, which is a very important and even a decisive factor for a healthy flow of this process. The solution of magnesia provides a slow and painless relaxation of muscles, lowering the tone of the uterus and bring it back to normal. Swelling on the face and body resulting from low water exchange, disappear quickly, overall health markedly improved. Reduces the effects of stress, which negatively affect pregnancy, sleep and relaxation stabiliziruemost. Magnesia is quite powerful and effective medicine, so it has its contraindications and possible side effects. It should not be administered in case of Allergy to the drug components, stable low-pressure patient, slow beats and disorders in the heart rhythm, chronic kidney disease. As side effects patients can observe excessive sweating, high body temperature, headaches. In such cases, dropper with solution of magnesia are eliminated or the dosage is significantly reduced. Sulphate of magnesium, or magnesia, is often prescribed to pregnant women for treatment of gestosis, edema, high blood pressure. The drug is administered intravenously in a hospital. In compliance with the dosages of the medicinal substance is safe for pregnant woman and fetus. Magnesium sulfate previously administered intramuscularly, which was very painful, women have any long-term persistent hematoma. 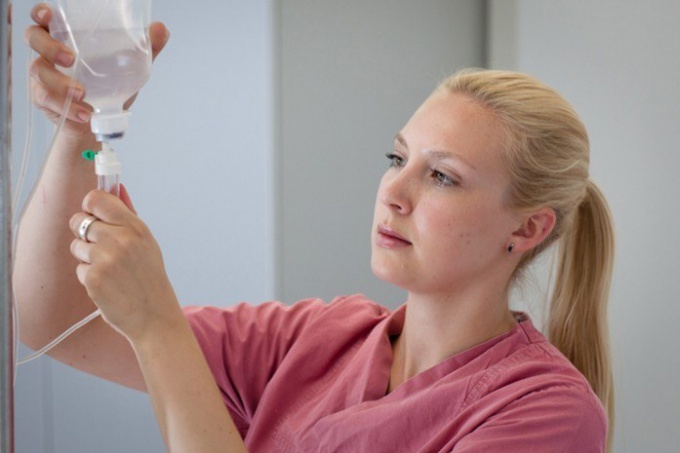 Intravenous drip is devoid of such disadvantages, and because the treatment does not cause pregnant women discomfort. If the woman gets to the hospital for preservation in the second trimester, it is almost always therapeutic scheme includes magnesium sulfate. Usually treatment for the same course, to prevent accumulation of magnesium in the body of the child. Solution is injected through a conventional IV line or infusion pump, if a woman is difficult to tolerate the drug, magnesium sulfate is administered in combination with saline. Magnesium sulfate is well relaxes the muscles, which is necessary for the tone of the uterus. It also supports the heart and prevents arrhythmias. The property to remove excess fluid from the body also extremely important for pregnant women, even when expressed edema they cannot apply the classical diuretics – infusion of magnesium sulfate eliminate swelling. Due to the ability to relax the muscles magnesium sulfate is often used as a means to lower blood pressure. Often women hospitalitynet with concomitant preeclampsia, she has edema, increased blood pressure. Infusion of magnesium sulfate allow you to quickly and safely solve this problem. The effect of the treatment time, almost always one course enough so the woman would carry the pregnancy without any complications and gave birth at term. At the risk of seizures, the threat of premature birth the first thing doctors do prescribe intravenous magnesium sulfate. This simple drug has saved many children's lives. Since intravenous administration of the drug immediately enters the blood, women may experience discomfort. Shortness of breath, shortness of breath, hot flashes, sudden loss of pressure or a burning desire to empty the bladder. You should tell the nurse, it will reduce the flow speed of the medicine or as directed by your doctor replace 25% solution solution of lower concentration. Such side effects are very rare and are immediately as it was discontinued or reduced supply of the drug. Before the introduction, it is recommended to go to the toilet, lie down as comfortably as possible and to provide their entertainment for the next 30-40 min. for 20 minutes after injection of magnesium sulfate is not recommended to get out of bed or make any sudden movements. At the expiration of this period to rise slowly, so as not to provoke dizziness.